Fifth-graders at Orchard Elementary School gathered to discuss "It Ain't So Awful, Falafel" by Firoozeh Dumas. Front row, L-R: Kylie Nash, Hannah Danaher, Lucie McCarney. Back row, L-R: Myra Waqar, Jane Sleiman, Scarlett Whipkey, T.J. Avonda, Jude Siddle. At the Orchard Elementary School in South Burlington, students come from a variety of cultural backgrounds. In fact, about a third of the students speak a language other than English at home. Last fall, a group of Orchard fifth-graders gathered to discuss It Ain’t So Awful, Falafel, a novel about an Iranian-born girl living in California in the late 1970s and early 1980s – much like author Firoozeh Dumas. In the book, Zomorod Yousefzadeh is the new kid in town, again. This time she decides to start over with a more American sounding name – Cindy. But when her native country starts making the U.S. news, and eventually American hostages are captured and held in Iran, blending in becomes the least of her problems. Author Firoozeh Dumas snapped a selfie when she went to record answers to Orchard students' questions about her book. Myra Waqar: "Why should students read historical fiction?" Lucie McCarney: "If we read what happens in the past, it could help us prevent that thing re-happening in the future." And Lucie's answer is pretty much author Firoozeh Dumas’ take on Myra's question too. Firoozeh Dumas: "We definitely need to learn all about history, because if we don't learn about it, we just keep repeating the same mistakes. And I think historical fiction is actually a really fun way to learn history because not everyone likes to pick up a history book. But when you read a story like It Ain’t So Awful, Falafel, it’s funny, it’s touching and at the same time, you learn a whole bunch of history without even realizing it." Fifth-grader Kylie Nash raises her hand to participate in the Orchard discussion of "It Aint's So Awful, Falafel" in November. One fifth-grader was curious how much the author's life influenced the novel. Kylie Nash: "How much of this story is based on your real life experiences? Firoozeh Dumas: "Well Kylie, I would say about 85 to 90 percent of it is true." And another student wondered if all the historical parts of the story fell in that true column. Firoozeh Dumas: "Well Jane, you know you can’t really alter the historical facts. But what I did do is – this is a work of fiction – so I took a bunch of my friends and I put them together. Like, one of the characters, Rachel, is a composite of several people. But all the historical facts in the book are 100 percent true." There are also characters, like Cindy’s good friends Carolyn and Howie, who are based on real friends Dumas had in sixth grade. Firoozeh Dumas: "And it’s funny because the same people I met back in middle school that I really liked, I still like them today – a lot. And I think that it’s really nice to actually have people that you have grown up with and who remember you back, way back when. And I hope that people remember this in middle school. I know it’s a really hard time for a lot of people. But there’s also some great friendships that can form then, so — and it does get better when you get older." Orchard School fifth graders Scarlett Whipkey, Lucie McCarney and Hannah Danaher discuss Firoozeh Dumas' novel based on her experiences when she was in middle school. While it’s hard enough for Cindy’s parents to understand American pop culture, things are about to get worse. As more and more headlines come out about unrest in Iran, some of their new neighbors turn to Cindy’s family to learn more about that country. But others react with hatred and cruelty toward the Yousefzadeh family. While the book takes place decades ago, one fifth-grader wanted to know what connection the author saw to today. Scarlett Whipkey: "Do you think these events could happen in present time?" Firoozeh Dumas: "Well Scarlet, yes, and they are happening in present time." Lucie McCarney: "What do you think about the present-day relationship between the U.S. and Iran?" Firoozeh Dumas: "Well Lucie, the present-day relationship between Iran and the U.S. is really, really bad. So, I hope that it gets better soon. I really, really do." Currently, the United States and Iran are clashing over nuclear weapon policies. When the book takes place, about 40 years ago, Iran was going through a political revolution. One fifth-grader wanted to know how that time period influenced the author. T.J. Avonda: "How did these historical events impact your life?" Firoozeh Dumas: "Well T.J., you know I ended up really becoming a writer because of all these events. Because I was going through experiences that no other kid that I knew was going through, and I just wanted the world to know what my life had been like. You know, it’s hard to learn about other people’s lives unless we either talk to them or we read their stories. And since I can’t talk to every single person, I write my stories." 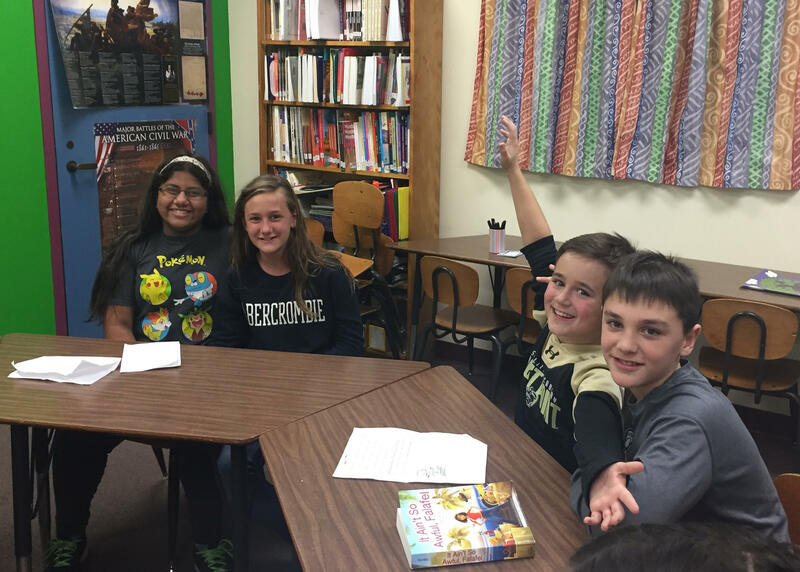 From left, Orchard Elementary School fifth-graders Myra Waqar, Jane Sleiman, T.J. Avonda and Jude Siddle pose during the discussion. And finally, one fifth-grader wondered about that writing process. Jude Siddle: "How long did it take you to write this book? And, also, how many drafts did it take you to write this amazing book?" Firoozeh Dumas: "Well Jude, that’s a good question. This book took me seven years and 26 versions. Now, you might ask yourself, 'Why did it take me that long?' And to be honest, I'd never written a book for younger audiences before, so — and this was also the first time that I was writing fiction. So it took me a long time to feel like I actually got it right. I hope I got it right." And Dumas says, in telling this particular story, she wants to remind her readers of how far a little kindness can go. Special thanks to Orchard School Library Media and Instructional Technology Specialist Donna Sullivan-Macdonald. 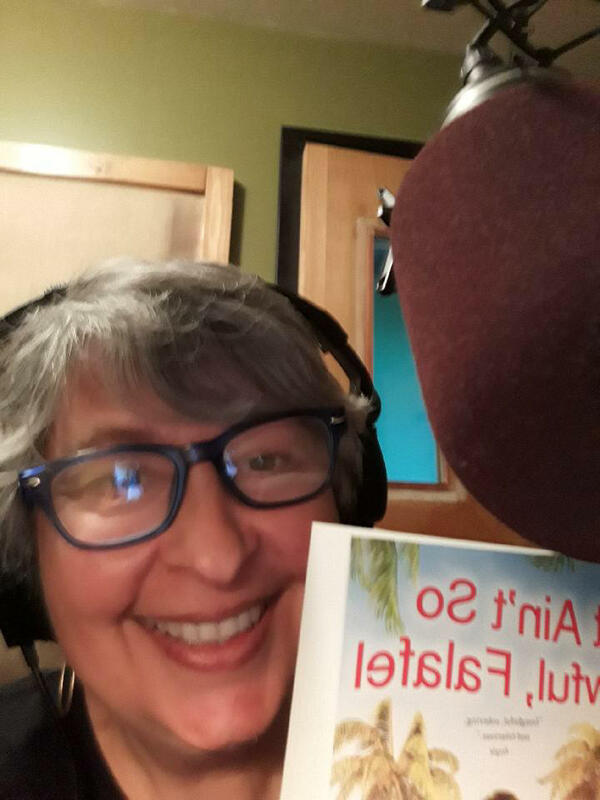 More episodes of Dorothy's List can be found on our program page — and find out what book was named the 2018 Dorothy Canfield Fisher Book Award winner here.